MORGANTOWN, W.Va. – WVU Medicine and the WVU Department of Behavioral Medicine and Psychiatry held a grand opening today (March 1) for the new WVU Medicine Center for Hope and Healing, a 29,305-square-foot addiction treatment facility that offers 12 beds for subacute medically managed withdrawal residential care and 30 beds for residential care up to 28 days. 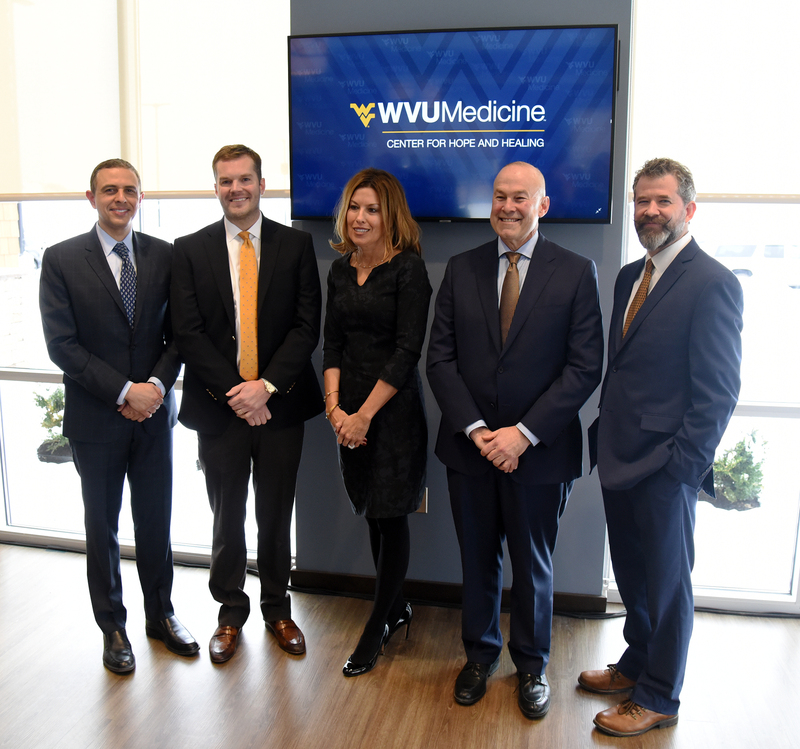 (From left to right) Ali Rezai, M.D., executive chair of the WVU Rockefeller Neuroscience; Douglas M. Leech, founder and CEO of Ascension Recovery Services; Amy Bush-Marone, R.N., B.S.N., M.B.A., WVU Medicine vice president of clinical operations; Clay B. Marsh, M.D., vice president and executive dean of WVU Health Sciences; and James Berry, D.O., director of addiction services, WVU Medicine Chestnut Ridge Center, and interim chair, WVU Department of Behavioral Medicine and Psychiatry, were among those gathered to celebrate the opening of the WVU Medicine Center for Hope and Healing today (March 1). The Center works to support adults struggling with substance use disorders through medically managed withdrawal stabilization and residential treatment. WVU Medicine and the WVU Department of Behavioral Medicine and Psychiatry already offer a comprehensive menu of outpatient services for people with substance use disorders, and the addition of withdrawal management and 28-day rehabilitation completes the in-house continuum of care for these disorders. The facility will serve as a single regional referral point for assessment of patients following discharge from local emergency rooms, inpatient detox units, and other referral sources. It will also accept self-referrals and referrals from community providers. In addition to celebrating the opening of the Center, officials also celebrated the receipt of a generous gift that has been made to support patient care at the Center for Hope and Healing. Douglas M. Leech, founder and CEO of Ascension Recovery Services, has established the Center for Hope and Healing Patient Care Fund with a gift of $60,000. The fund, which will offset the cost of treatment, will benefit patients seeking care at the Center for Hope and Healing. 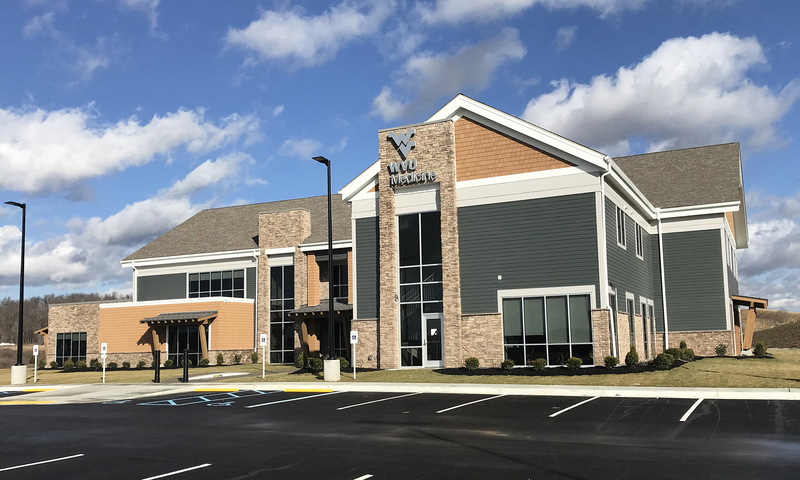 “The WVU Center for Hope and Healing will provide the highest quality clinical care for those in our state struggling with addiction, regardless of the payer type. An option like this has only been offered in the past out of state to those who have commercial insurance and the ability to cash pay a hefty fee,” Leech said. Ascension Recovery Services, located in Morgantown, specializes in addiction recovery and treatment. To make a gift to the Center for Hope and Healing Patient Care Fund, please visit give.wvu.edu/wvumedicine-rni and refer to fund 2W1371 in the comments box. For more information about the center or making a gift, please contact Laura McCall, senior director of development for the Rockefeller Neuroscience Institute, at 304-293-5757 or laura.mccall@hsc.wvu.edu. This gift was made through the WVU Foundation, the non-profit organization that receives and administers private donations on behalf of the University.